During the renovation of the firehouse, the fire engines used this temporary structure. Time lapse video of an 80' x 310' tent installation by Tents For Rent. It was used as a temporary body shop to repair over 20,000 cars after a hail storm. This tent was used to support an industrial project. Tents For Rent provided heating and lighting as well. Complete with lighting, heating and generators, this tent was erected on very short notice. Don’t let the elements prevent you from completing your projects. 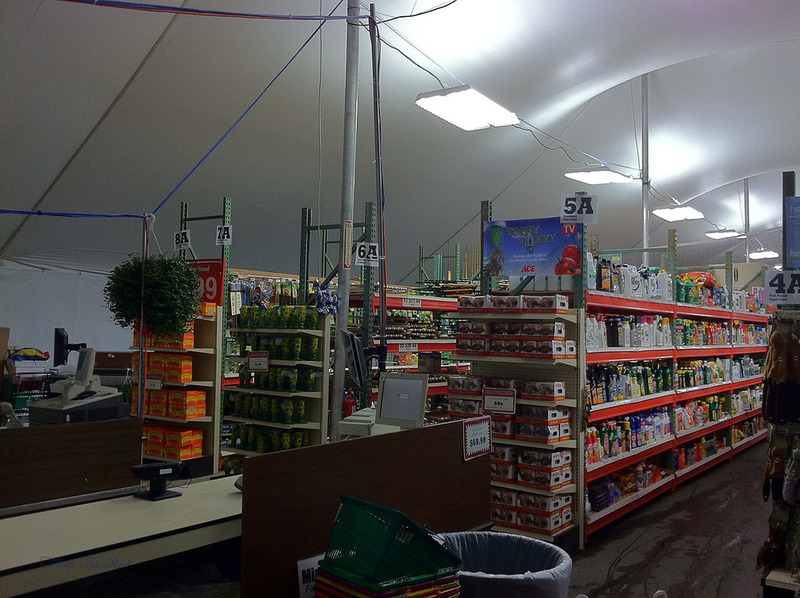 Stay productive with an industrial tent rental. It’s a convenient way to cover your job site without constructing a permanent building. When you need temporary coverage for warehousing, storage or manufacturing, you can rely on Tents For Rent. We’re committed to providing the best service for our customers and listening carefully to your unique needs. When you call us for construction tent rental, our team will install a durable, temporary tent to protect your materials and employees from the inclement weather. In fact, because of our exceptional service, many of our customers choose to invest in our rentals repeatedly. We offer dependable industrial tent rental services—when you rent from us, you’ll receive nothing but safe, high-quality equipment. Do you need to store your product during a remodeling project or simply need a temporary warehouse to keep up with demand? We can provide you with heavy-duty industrial storage tents, heating, cooling, lighting, generators and much more for your next project. * Manufacturing and much more. We have hundreds of tents available for rent, so whatever size or style you need, we can provide reliable shelter that meets your requirements. That’s warehouse tent rental done right! The best part is that we install our structures quickly, so even if you have a project that comes together at the last minute, you can start right away. Our team has decades of tent installation experience, meaning you can relax knowing that there won’t be any hassle. Our experts will make sure you can keep your project moving. If your organization requires industrial, warehouse, or construction tent rental, let Tents for Rent help. We look forward to exceeding your expectations. Email or call us today at 717.733.9700 to see how we can make your project a success.